Ever noticed this super cool feature FunnelFlux has called the shortcut palette? So what on earth does it do? Well, if you have ever used something like SublimeText it will be quite familiar. The shortcut palette is a way for you to quickly access functions without having to navigate to different pages and wait for things to load. Let's say you're on the offers page and you realise you want to make an offer source. 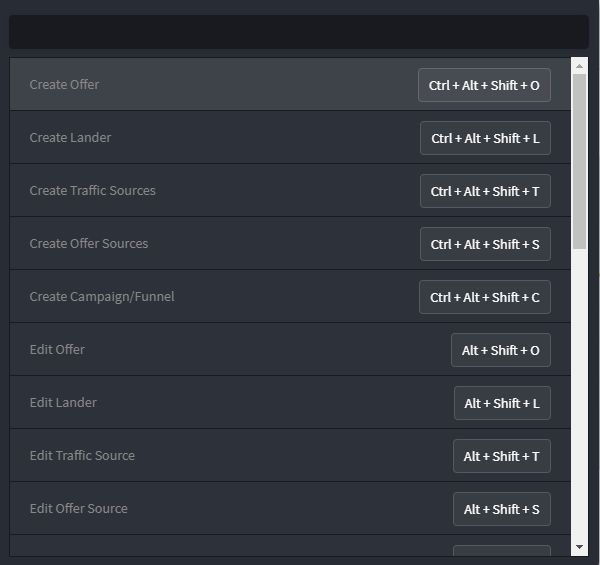 Now you can click "Create Offer Sources" to bring up the dialog for this. Note that each item has it's own dedicated shortcut as well. Once you fill in the offer source details, you can click save then close the dialog. Now you can hit Ctrl+Alt+P again, write offer, click create offer and create an offer under that newly created offer source -- all without leaving the page you are on, e.g. the funnel editor. For those of you who are keyboard ninjas, this will help you save time with basic add/edit functions since you don't need to wait on navigating around the UI.